"The RoboCup CITIZEN Mini League project is a joint research effort supported by CITIZEN Co. Japan and JST ERATO Asada project. We are aimed to the development of a new RoboCup league based on the CITIZEN's new miniature robot, the Eco-Be! . This new league is intended to cover a wide range of different fields of research by offering a flexible and versatile augmented reality environment were real and simulated artifacts interact with each other." The battle field (futbol pitch) is pr ojected onto a table. 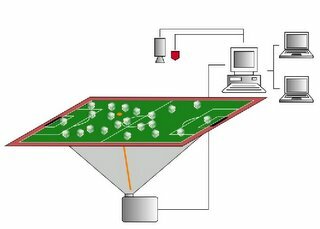 The postions of the little players will be monitored through a camera and fed to an off-field 'coach' computer. They will take their instructions from the coach who will yell commands to the players through infrared sensors. 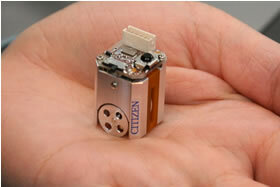 Citizen will sell the robots and is continuing development of the Eco-Be! to improve their performance and add more sensors. CITIZEN Eco-Be! League | Where simulation meets reality.